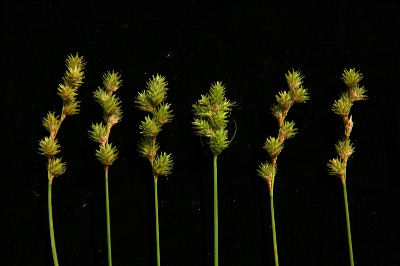 Usually in moist fields, thickets, and open forests; but also sometimes in drier settings. A tall species with relatively few stems in a clump; the perigynia are green at maturity. Although present (but rare) in the western Upper Peninsula, a September 1888 Farwell collection purported to be from Keweenaw Co. is likely mis-labeled and is not mapped. MICHIGAN FLORA ONLINE. A. A. Reznicek, E. G. Voss, & B. S. Walters. February 2011. University of Michigan. Web. 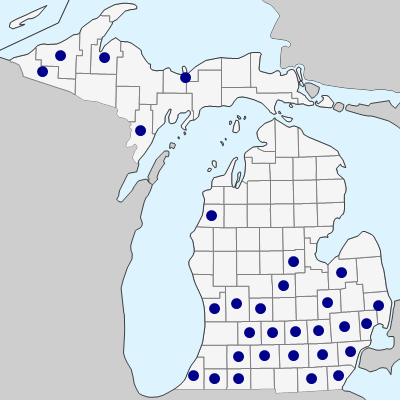 April 22, 2019. https://michiganflora.net/species.aspx?id=1016.